Discussion in 'Android Devices' started by wenmyster, Dec 29, 2009. Anyone know any good thin ones? I've heard of the ZAGG invisible shield but unfortunately they don't have for HTC Eris. Anyone know any good ones similar to ZAGG? Thanks! zagg actually does sell the invisible shield (full body and screen) for the Eris. after removing the tape in like lets say 6 months, will the cell phone be all sticky on the outside due to the sticky residue from the case cover? yes. I don't like zagg, personally. Doesn't really do anything for drop protection. Been looking for a cover too. Just ordered a cheap ~$5 "skin" from the chicoms on eBay. Not here yet, but I will report how I like it, when it comes in. I recently picked up a cover off Ebay from NakedCellPhone and for the $9 is cost it's pretty nice. Texture is similar to the phone body itself which I find very nice as it provides grip but still slides into a pocket easily. Case isn't too thick but feels substantial enough. With free shipping it was a great deal. When I got home from work yesterday, mine was waiting for me in the mail. Not bad, about a week from China and I really like it. I can compare it mostly to the silicone/rubber skins you can get for the iPhone. Covers the back, top, bottom and sides. My only dissapointment was no access hole on the bottom for the USB port. I fixed that with some careful X-acto cutting. Overall, good snug fit and should keep the wear and tear down to a minumum. I think the thickness of the phone maybe increased by 25%, not bad. After hitting about 7 verizon stores, i finally found one that had the clear hard plastic cover.. I love it personally. It makes the phone ticker, sure, but it makes me feel like i can not worry. Like when you buy new shoes, you are always afraid.. well with this i never worry. Only problem is the top screen side speaker which has some scratches, but barely noticible. The ccreen protector i bought seperate and now i can take it out and the phone is basically mint. Also, the other day as i was jumping out of my car i heard a bang! I almost cried when i saw the phone had hit on the corner then bounced on its back then landed on its screen and slid a little. I picked it up and a small mark on the case but not a SCRATCH on the phone! The cases lip FULLY protected the screen!! Hope this helps. I could take pics if u wanna see what it looks like. When my wife got her Eris, one of the VZW employees had a "half" case for her phone. It was $20 and I figured I could get one for substantially less online but have looked yet. As I recall, it was hard plastic, not silicone, and again, only covered the bottom half of the phone, effectively a thickened back half. They had colored ones too, I believe. I don't think they were Verizon-branded either. Will have to go back and find out what they are for sure. yeah mine was about $20 but with tax came to $25 and like I said I couldn't be happier. Mine covers the back and has a lip around the front which protects it FULLY from drops and stuff only thing is I scratched the screen by stupidly putting the phone in my pocket with my keys but it had a screen protector on it so i just took it off and put a new one on (Come in packs of three) and Bam! perfect Eris once again! -- Ill post pics soon.. I threw the box away, so I'm not sure of the brand but i did buy it at a Verizon store.. one of the large ones, not one of the small mall-sized ones. I would 100% recommend it to anyone! Duct tape seems the best method. I agree with Caddyman. lol! What I use is a Snap-On black Leather cover from Verizon. About $25 from most Verizon stores. I like it. Makes it fit better in my hand. Especially when I use one hand to flick and click stuff. It will not pop apart when you drop it. (Unless you throw it against the floor..then.. it might) It doesn&#8217;t fade, crack, rip (It may in some cases, but unlikely). It's just a very durable case. I HIGHLY recommend it. The Body Glove case from the Verizon store is a very good case too. It's 30 bucks but it's a good case. It's a 2 piece snap together style. Hard plastic with the soft rubber grip feel to it. is hard to remove but it won't pop off if you drop it either. It adds a bit more size to the phone which I like, feels better to grip. get a TPU (thermoplatic polyurethane) case from eBay. softer than plastic and harder than silicon. form-fitting, yet flexible, AND it repels lint. got mine for $7.50, shipped from Cali in 3 days. If you dont mind, could you please a link or something. I tried searching ebay with "thermoplatic polyurethane case"
Oops nevermind found it with "TPU eris"
^Check the seller Pawavenue. That's where I got mine. FYI: The generic $1.99 and similar Ebay screen protectors are garbage. I bought 5 for $3.99 from a popular Ebay seller and they shrink and do not last very long. Absolute garbage. Awaiting the Skinomi that I ordered from Amazon now. just received my Seidio Innocase II (along with their Ultimate Screen Guard). VERY nice. 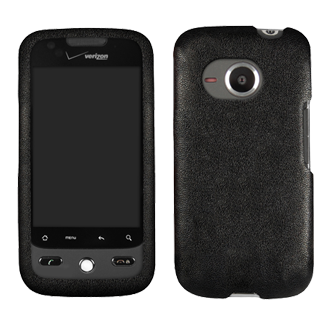 i don't really have anything to compare it to as i've never used the hard snap-on type case on any phone before, and was using the verizon silicone gel case up to now for the Eris (a bit bulky and prone to collecting dust and debris). but it's nice. almost looks and feels as if i don't have a case on at all. hardly adds any bulk to the phone. cutouts are perfect. nice feel, fit and finish. i love how the top and bottom halves slide on gently and lock into place without any sharp and obtrusive clips. yet it seems very firm. the fit is lock-tight, yet i wasn't worried about damaging the phone in any way when putting it on. there is felt on the inside back portion and along the edges. and the felt isn't roughly cut like i've seen on many cases, even those made by major manufacturers. all in all i'd say this is a very high quality case. seems like it will stay on well and protect the phone nicely while not detracting from the appearance in the least. the ultimate screen guard is great, too. i was extremely careful when applying it to try and avoid getting any dust on the underside and to align the protector perfectly because i know that the slightest dust will make these static-cling-type protectors come up, as will a little overhang off the sides of the screen. i did get a small bit of dust or something under the protector near the earpiece, but it still seems to have adhered around it pretty securely, unlike the Verizon protectors. and there is also the slightest bit of overhang at the bottom left (like fractions of a mm) and a tiny bubble will once in a while form there which i can usually smooth out. otherwise it seems to have gone on very well and is completely clear. SOOO much better than the invisible shield protector i had on before which looked terrible. it doesn't look like i have anything on the screen at all and it's made out of a substantial plastic (and it's made in Japan! i think the combo of these two products is perfect. pricey ($43 and change shipped), but perfect so far. i will also add that it arrived very fast. i believe i placed my order late in the evening on monday and got it today, using their cheapest shipping method. the only complaint about the company is that i sent two emails asking a product question and have heard nothing back in 2 weeks. very poor. but everything else makes up for that. i just hope i don't have to return anything. I have the snap-on clear plastic case and dh has a similar one that has a silver rim. They work great and do not stick to my hair or rip it out like some sticky plastic covers tend to do.